Hey everyone! We are super excited to announce a tour we're hosting for a YA Contemporary Book, MY ALMOST FLAWLESS TOKYO DREAM LIFE by Rachel Cohn which releases on December 18, 2018! The tour will run for two weeks - from December 3rd-31st will have one stop per day and will consist of a mix of reviews, interviews, excerpts, & spotlights. 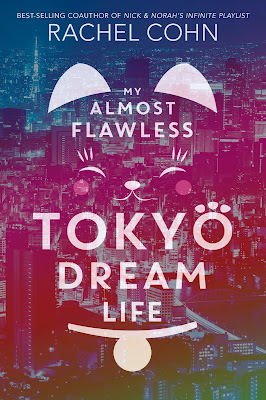 We are totally stoked for the tour for MY ALMOST FLAWLESS TOKYO DREAM LIFE this December! We can't wait for everyone to read it! Enter foster-kid-out-of-water Elle Zoellner, who, on her sixteenth birthday discovers that her long-lost father, Kenji Takahari, is actually a Japanese hotel mogul and wants her to come live with him. Um, yes, please! Elle jets off first class from Washington D.C. to Tokyo, which seems like a dream come true. Until she meets her enigmatic father, her way-too-fab aunt, and her hyper-critical grandmother, who seems to wish Elle didn't exist. In an effort to please her new family, Elle falls in with the Ex-Brats, a troupe of uber-cool international kids who spend money like it's air. But when she starts to crush on a boy named Ryuu, who's frozen out by the Brats and despised by her new family, her already tenuous living situation just might implode.